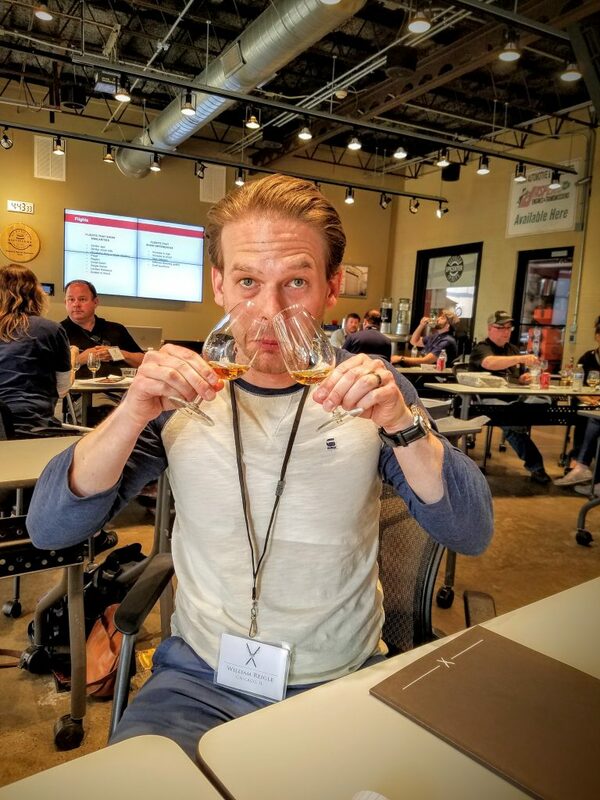 Home » Blog » Process » Executive Bourbon Steward Training – Part 2! In last week’s article we learned about the Stave & Thief Society Executive Bourbon Steward program. 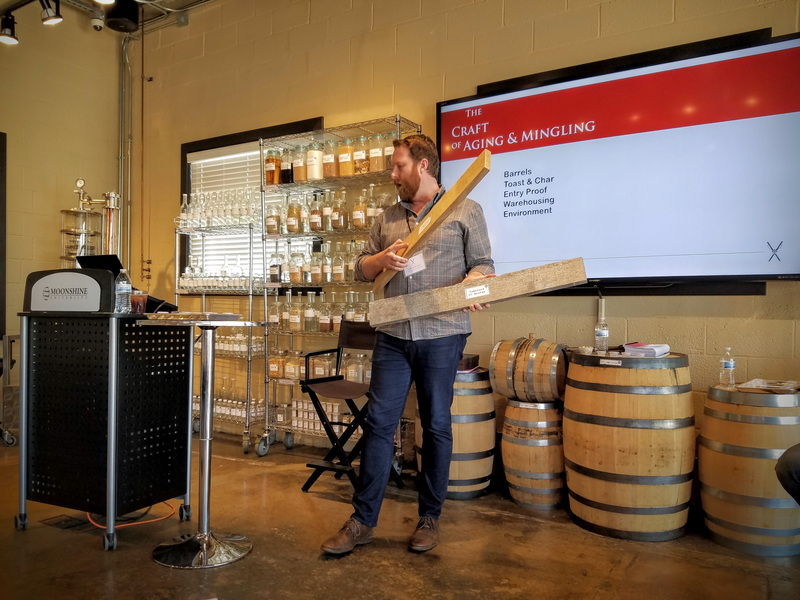 We had an introduction to whiskeys of the world, learned what defines a bourbon, and had a little fun with a few well-known brands. Be sure to read last week’s post if you missed it, click here. 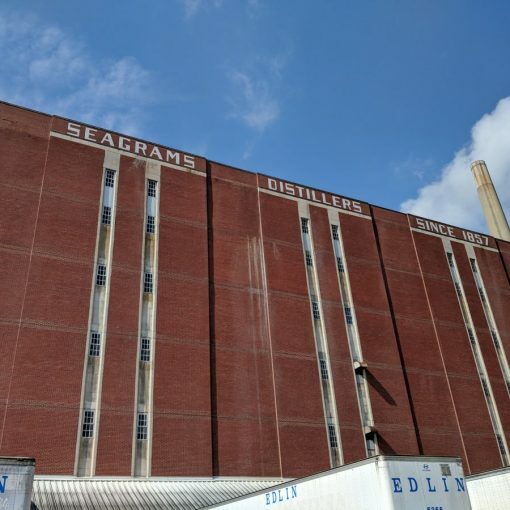 Today we’re going to have some fun learning about the bourbon distilling process, how bourbon is aged, and tips on nosing and tasting bourbon. The very first step in the process of distilling is grain selection. The mashbill chosen for our class was 75% corn, 15% rye, and 10% malted barley. This is a fairly typical bourbon mashbill. Now that we had our recipe it was time to head into the distillery! The distillery at Moonshine U is used primarily for educational purposes. They do not have the legal ability to distribute bourbon produced here outside of the distillery. It’s a shame really but everything we make today will be dumped. 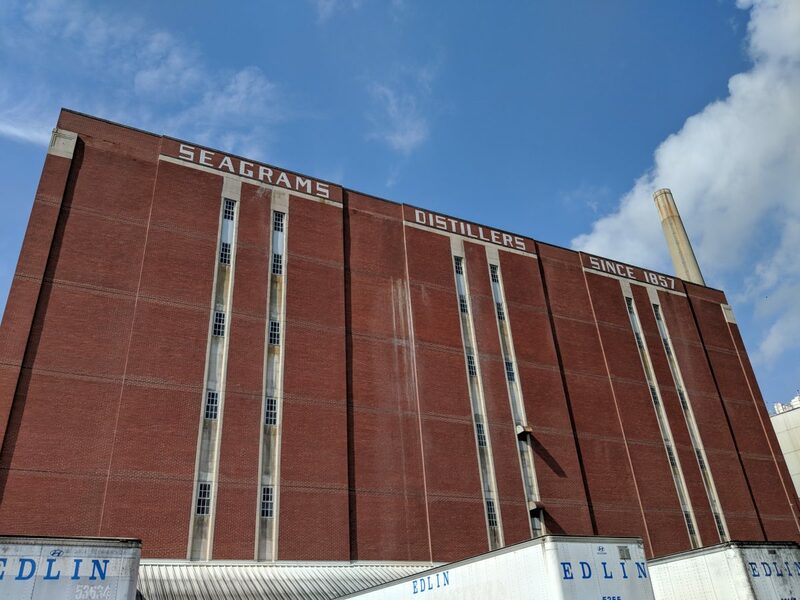 The distillery consists of a milling machine, mash cooker, three stainless steel fermenting tanks, and the still. The still is a hybrid, a column mounted on top of a pot, from Vendome Copper and Brass Works. 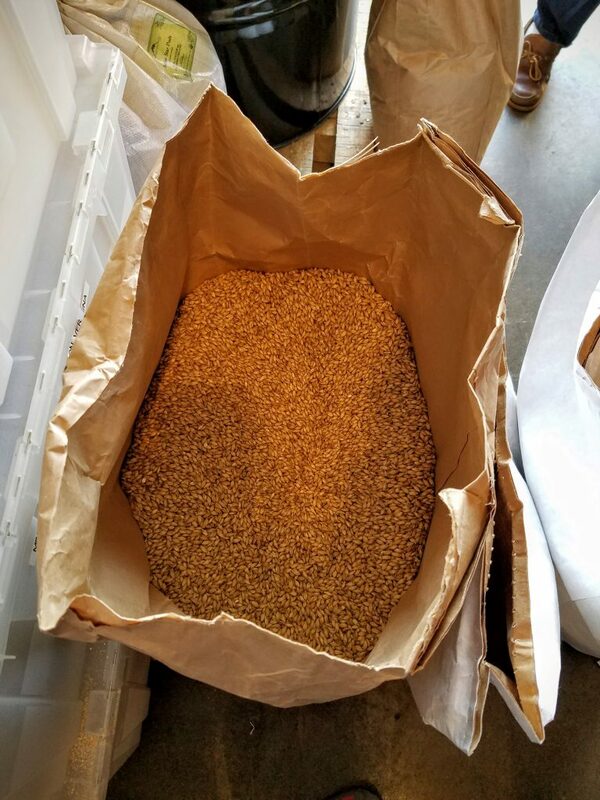 The Rye grain we added to our mash. The mill we used to grind corn and rye. 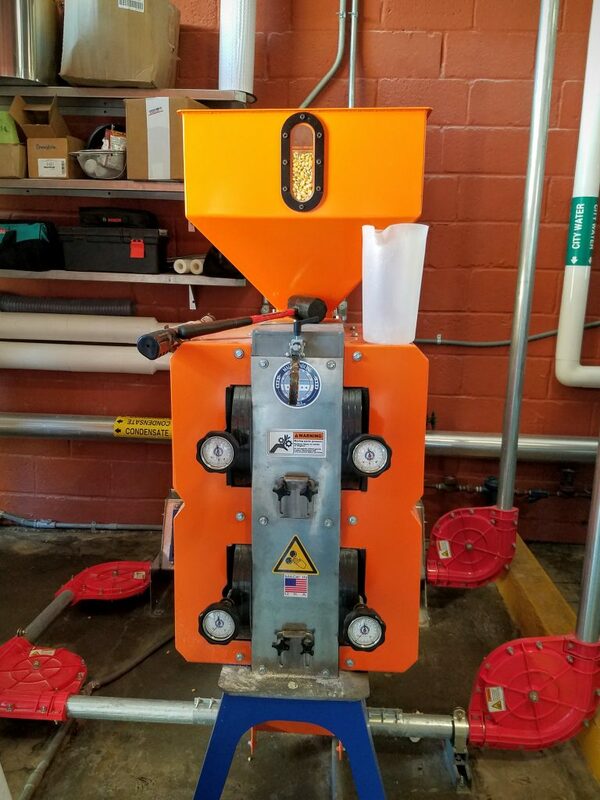 Milling maximizes the surface area in order to expose as many of the starches in the grain as possible. A classmate adding a bag of corn to the mill. From here the ground grain is pumped into the cooker. Milled corn pulled from the mill on its way to the cooker. 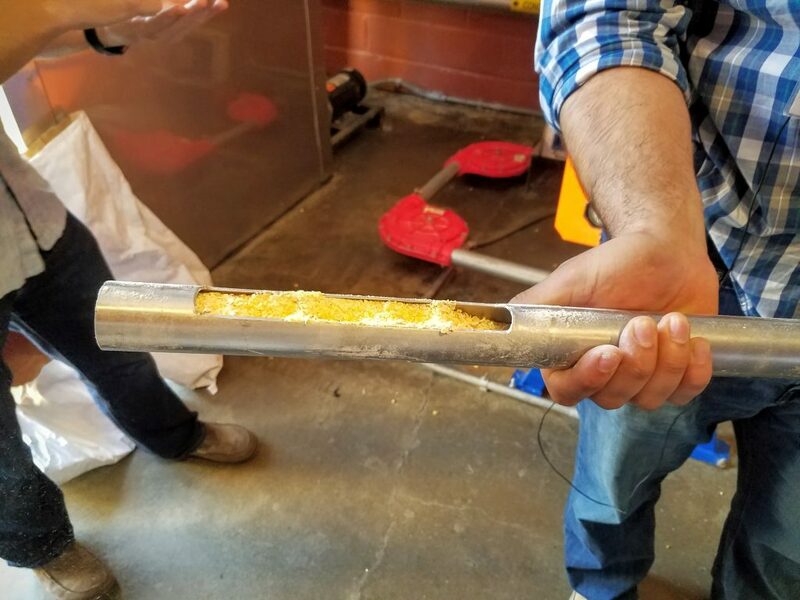 Tyler Gomez-Basauri fired up the mill and we took turns dumping in our corn. As it was ground into a fine powder it made its way through a large hose and into the mash cooker where hot water was swirling to begin the process. 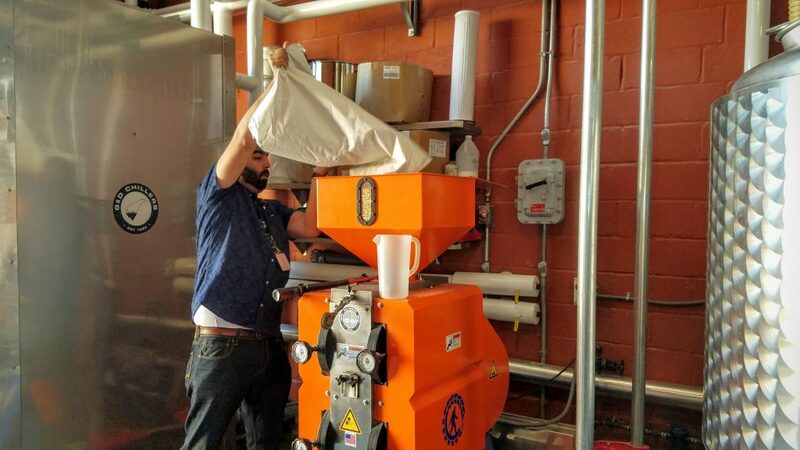 Once the corn was added we milled our rye grain and into the cooker that went as well. The grain is milled in order to break it down and expose the starches inside. The cook softens and breaks down these starches getting them ready to be converted to sugar. 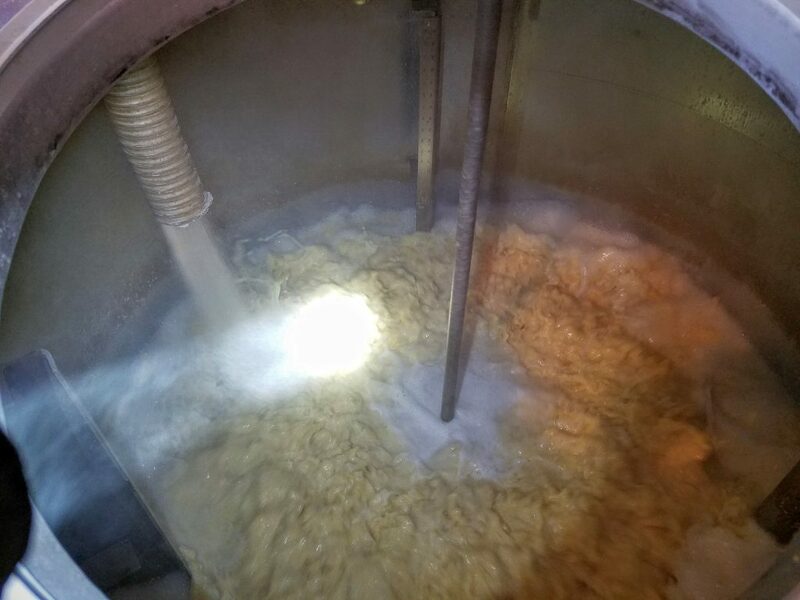 After a short while cooking, the mash is pumped into the fermentation tanks where malted barley is added to kick off the conversion of starches to sugar. Depending on temperature, the mash will ferment for 3 to 5 days. Here’s where the “cooking show” magic came in. Tyler already had a tank of fully fermented mash, or distillers beer, ready for the next phase, distillation. Here I'm checking the cook. Everything looks good! A view inside the cooker. Corn, rye, and water. Stirring malted barley into the mash to begin the conversion of starches to sugar. Remnants of distillers beer pouring from the fermenter. The rest made it into the still! Using the same pump as before, we pumped the beer into the pot of the still. Our whiskey went through what is called a “double distillation” process. 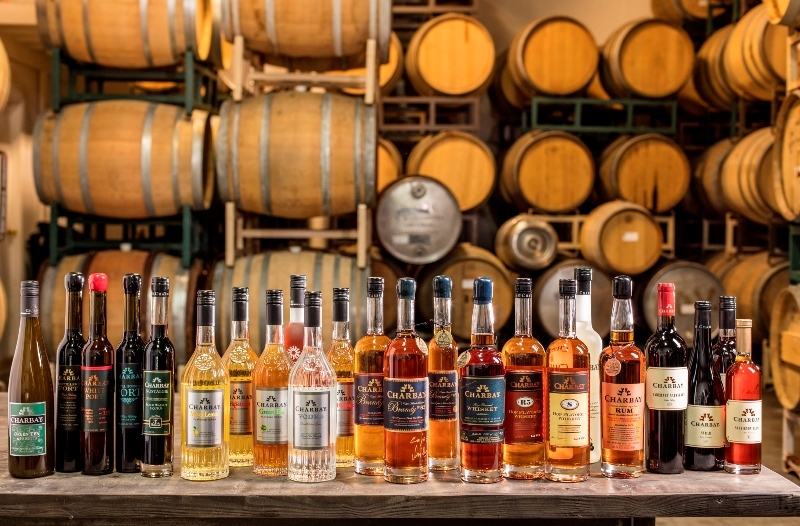 The first run, known as the ‘stripping run’ produces low wines of 70 to 80 proof. 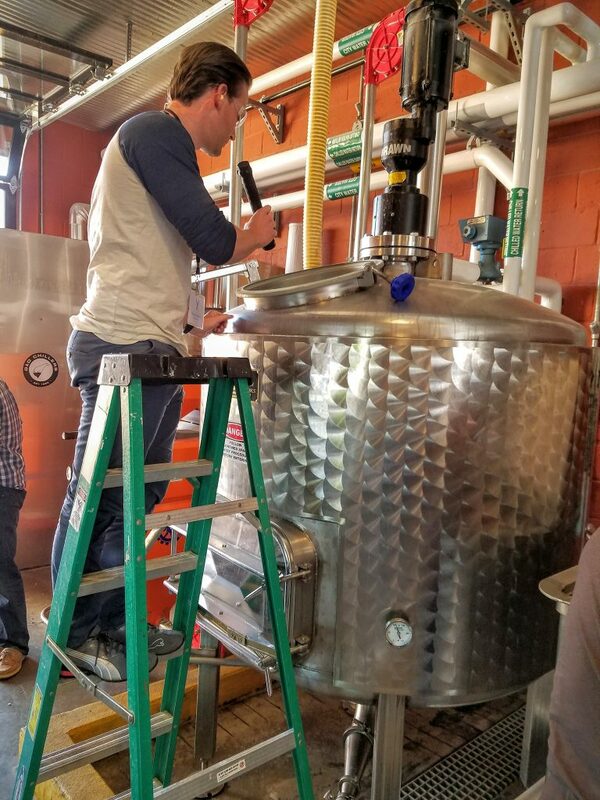 This can be run multiple times to strip the alcohol from the beer (water and grain) and producer a higher proof distillate with each run. The ‘second run’ further distills those low wines to produce high wines. This further cleans the spirit and raises the proof. During this run we used a hydrometer to continuously measure the proof of the spirit coming off the still. We did this to separate the alcohol into three parts, the cuts known as heads, hearts, and tails. 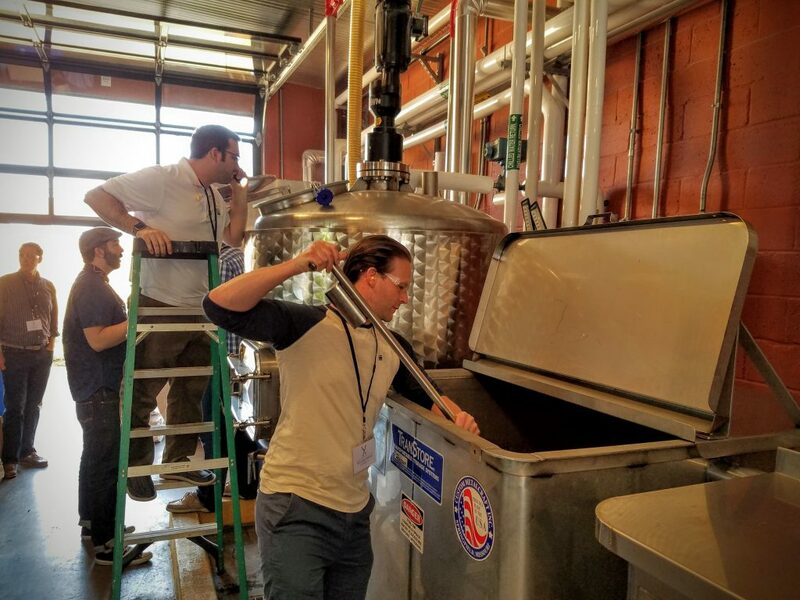 There are three containers to catch the alcohol coming off the still. Each “cut” is the process of dispensing the alcohol to the next of those three containers. At the end we’ll have three separate cuts of alcohol. The heads come off at the beginning of the run and are undesirable types of alcohol. Once the alcohol coming off the still reads to about 75 proof we are in the hearts zone and cut to the second container. About 80% of the distillate will be in this hearts zone. When the proof gets higher, 100+ proof, we’re in the tails zone and make the final cut. Kevin and Tyler showing off their Vendome hybrid still. Often times distillers will combine the hearts and tails and run them through the still again to extract as much of the desired alcohol as possible. When the process is complete the master distiller will decide how much of the hearts, and possibly tails, to combine along with water before barreling. This decision is led by the desired end product, how long he intends to age the spirit and his own experience. When some of the stillage/backset from a distillation run is added to the cook of the next batch. This is the most common type of bourbon. It provides a consistent flavor, maintains pH, adds nutrients, and in larger operations saves energy. This process uses only fresh grains and water for the cook and fermentation. This can produce its own desired flavor profiles. 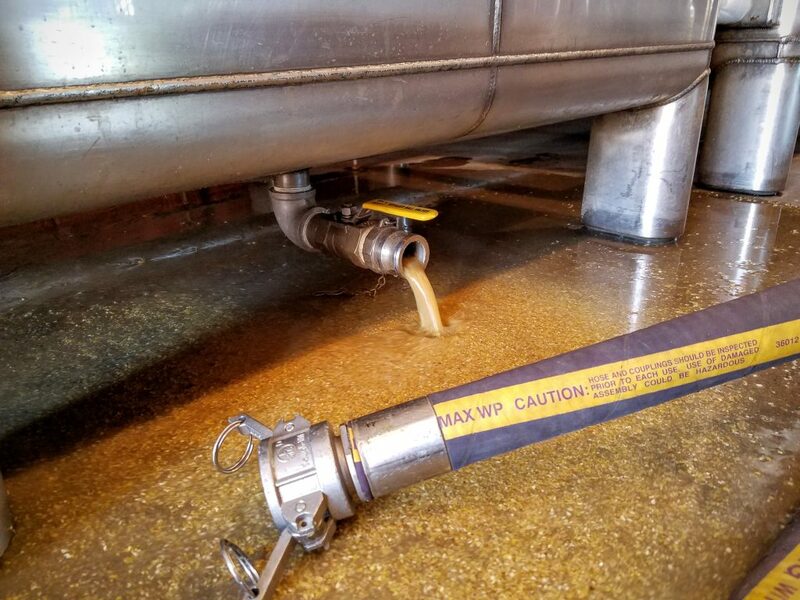 Producers who do not constantly distill may have to use this process as sour mash stillage is only good for a day or two. 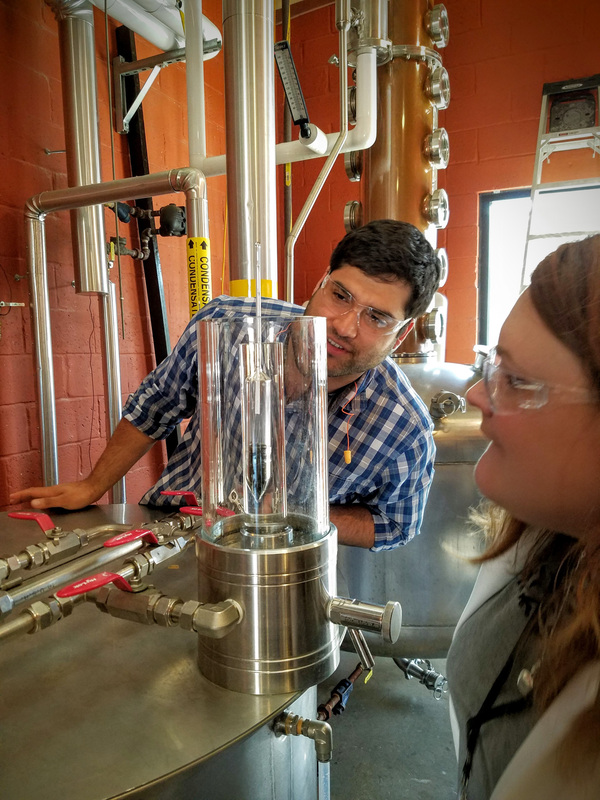 Instructor Tyler and a classmate measuring the proof of the distillate coming off the still. Now that we have our “white dog” or “white lightning”, the whiskey that will go into the barrel, let’s take a look at the aging process. Aging in new charred oak barrels gives bourbon the great majority of its color and flavor. American oak is typically used, one of the most prominent cooperages in the world is Independent Stave Company. Though French oak as well as other types can be used. Colin and Kevin spent some time telling us about barrel stave seasoning and toasting vs. charring. Toasting involves exposing the barrels to a lower heat for a longer time. Charring is a high temperature open flame for a short period of time, usually under 60 seconds. There are different char levels, typically #1 through #4, with the highest char resulting from longer exposure to the flame and a darker more alligator like texture. Inside the barrel three things happen: Additive, subtractive, and interactive. In addition to adding color and flavor, Charring is also subtractive. The activated charcoal/carbon pulls out the tails and heavier compounds. Charring releases wood sugars and sweetness. Toasting imparts more color than charring. It releases tannins and vanilla/candy notes from the wood. Toasting is additive, not subtractive. Colin showing us the difference between new and seasoned wood staves. Earlier we learned about how and why cuts are made at certain times by a master distiller. Two of the factors that determine how much hearts and tails end up in a barrel are the size of the barrel and the amount of aging time. Smaller barrels and shorter aging would want to use tighter cuts of hearts only. Smaller barrels have less surface area for the bourbon to contact and shorter aging time reduces the chance for the tails to filter through the wood char. In a larger barrel aged for a longer time a more generous cut including hearts and tails can be used. More time in the larger barrels leads to a more complex bourbon when the tails are included. There is no substitute for wood and time when it comes to bourbon. A large part of the class centered around improving our ability to nose and taste bourbon. Anyone can smell a glass of bourbon; being able to identify characteristic scents, specific alcohols, and grains is a learned skill. For this section we walked next door to the Flavorman Beverage Development Company where we met with David Dafoe. David is one of the country’s foremost authorities on flavor and founder of Flavorman and the Distilled Spirits Epicenter. Bourbon samples and the study guide. We were not allowed to take pictures inside the lab so here’s my account. Flavorman develops beverage flavors for many of the world’s most high profile beverage companies. It’s very unlikely you haven’t sampled some of their work. The lab was setup with a station for each of us. 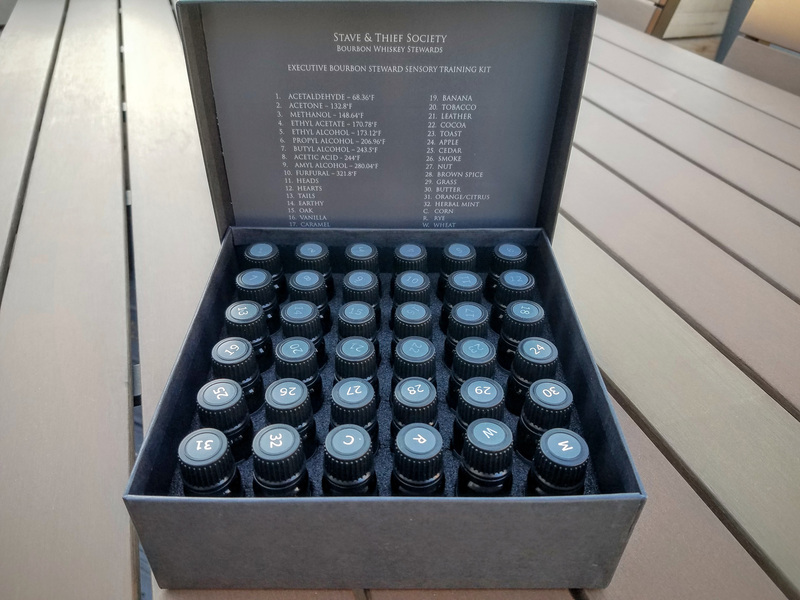 At the station was our “Sensory Training Kit” containing 36 scent samples. The 10 major alcohols produced during distillation, the heads/hearts/tails, samples of corn/rye/wheat/malt, and various major scents used to describe bourbon. A few of these samples being “earthy”, “oak”, “caramel”, “tobacco”, “leather”, and many more. David walked us through nosing the 10 alcohol samples along with the heads, hearts, and tails. We reviewed the temperature at which each alcohol evaporates. This tells us at what time during a distillation run each alcohol will come through the top of the still; helping us decide when to make the cuts. The sensory training kit we nosed during class. Next a tray of seven samples was placed in front of each of us. The tray held samples of new make, 2 year, 4 year, 6 year, barrel #1, barrel #2, and barrel #3. All of the same bourbon (19% rye at 80 proof #3 char), the only variances being age and which barrel it came from. 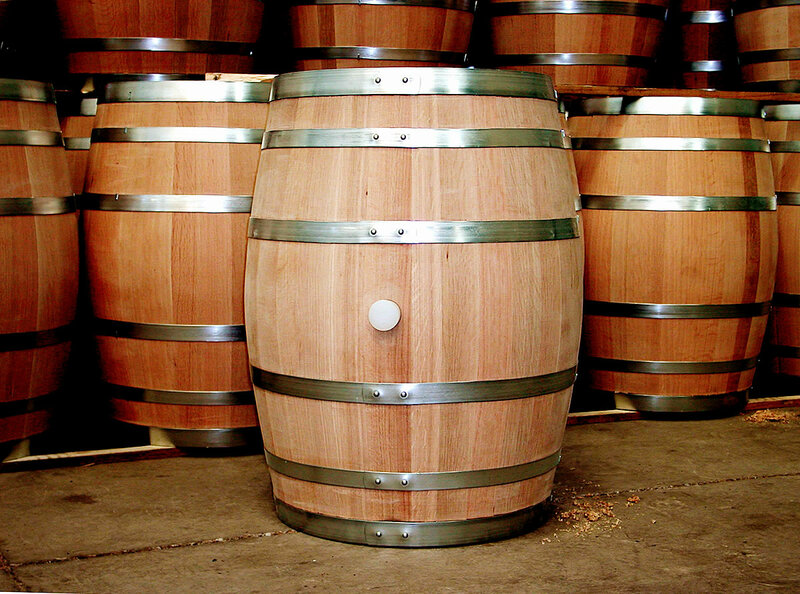 The different ages are easy to figure out but what does the barrel number have to do with the finished product? The wood used to make the barrels comes from different trees, different parts of the tree, and can be treated differently. (Read our Buffalo Trace Single Oak Project post for a great example of these variations, click here). Rickhouses that hold bourbon barrels can be made of brick, wood, sheet metal, concrete. They can be a single story tall (Four Roses) or multiple stories. The barrels might be rotated (Maker’s Mark) or kept in one place. All of those things affect the bourbon inside these barrels and influence the nose and taste. 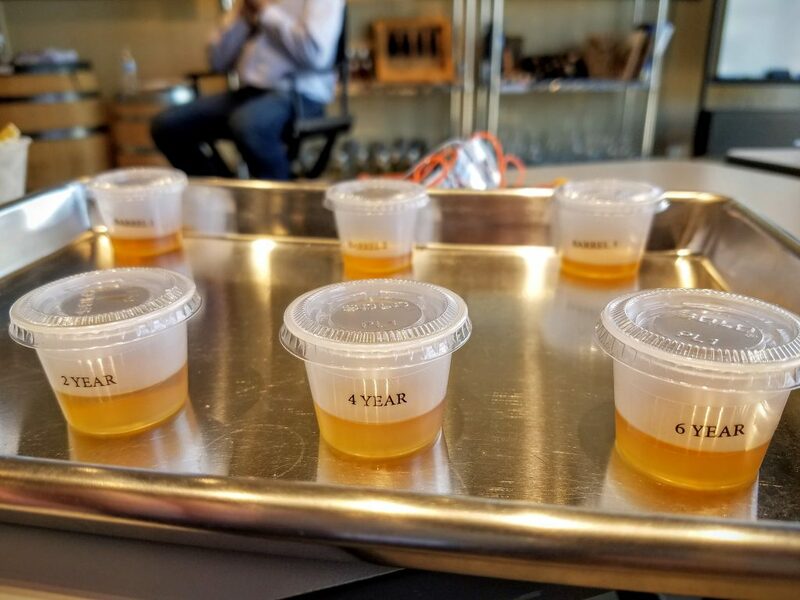 Below are our nosing and tasting notes from these seven samples. Samples of 2, 4, and 6 year bourbon along with three different barrel samples. Used to show the difference age and barrels make to the nose and taste of bourbon. New Make: Grainy, corn, a little spicy rye, botanical, malty, light mouthfeel. 2 year old: Sweet, mellow, toast, less grainy, a little sweet, butterscotch, warm, spicy/peppery, heat, oaky, not complex. 4 year old: Darker, smoky, woody, caramel, cherry, oak, less astringent, charcoal cleaning up heavier compounds, fruity notes, longer finish. 6 year old: Vanilla, oak, less sweet, rye, cherry, banana, warm mouthfeel, reduced heat/burn compared to 2 year and 4 year, balanced, complex, lingering finish. Barrel #1: Light, smoky, candy, pear, astringent, warm. Barrel #2: More caramel, less astringent, not as hot. Barrel #3: Sweeter, peppery, bigger and bolder, strong finish. One of the biggest challenges of the master blender is creating a consistent product with varying barrels. It’s an art to maintain a consistent bourbon year over year and batch over batch. Blenders use a control sample of a previous batch to help them find the right flavor profile. As the end of the day grew close Colin passed out the Executive Bourbon Steward written exam. It consisted of about 50 multiple choice questions testing our knowledge of the facts, concepts, and methods learned throughout the day. The last time I took a test like this, in a classroom surrounded by my peers, was in college. If I had taken bourbon tests in college I don’t think I ever would have left. There were a few tricky questions that I had to re-read a few times to dig out exactly what they were looking for. After a grueling hour of drawing circles to the best of my ability I turned in my test. While the tests were being graded we moved on to the second part of our evaluation. Blind tasting bourbon and constructing flights. For this final part of the class we were broken into groups and given a flight of three Bourbons. We had to nose and taste these Bourbons, taking note of their characteristics. The goal was to attempt to 1) Identify the mashbill, age, producer, and individual bourbons. 2) Decide if the flight was designed with complimentary Bourbons or Bourbons meant to show differences between each other. This was tough. We were able to identify individual characteristics and note that these were rye Bourbons of a general age range. Though calling out the producer and exact bourbon would prove to take a lot more practice. Now you know what I’ll be doing with my free time for the next few months. Flights can be designed to showcase similar Bourbons or to highlight differences. In our case we sampled three Bourbons from three different producers, all were rye based, and all were of a similar age. This allowed us to pick out different influences of each producer. This is NOT the right way to nose bourbon. Though it makes for a fun picture. This was a small sampling of the immense knowledge presented by Stave & Thief and Moonshine University. 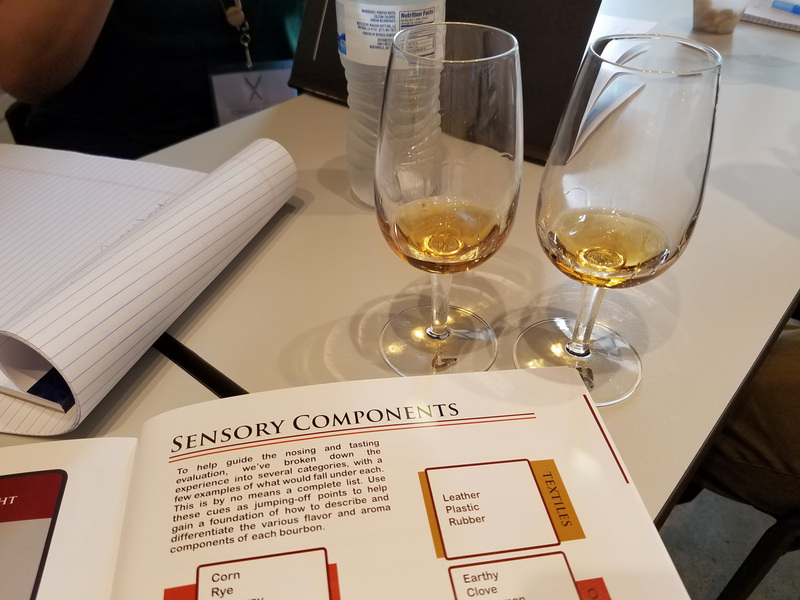 In addition to what we looked at above; every participant walked away with a detailed history of bourbon, a knowledge of Kentucky bourbon distillers and their brands, an understanding of the science of bourbon production and much more. If this is something that interests you please use the contact information below to register for a future class. You can also leave a comment below or reach out to me directly with any questions, comments, or just to talk bourbon. 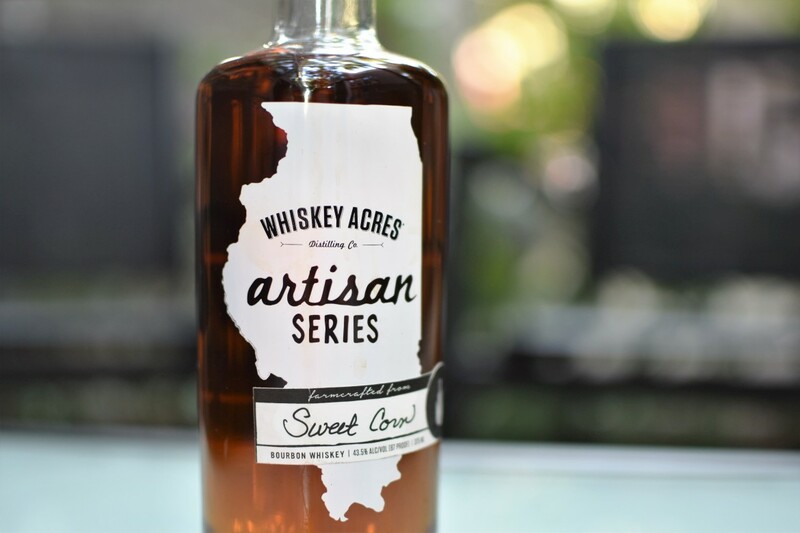 And if you do become an Executive Bourbon Steward, find me in Chicago to try your hand at a drink on me. You’ll know what that means…. 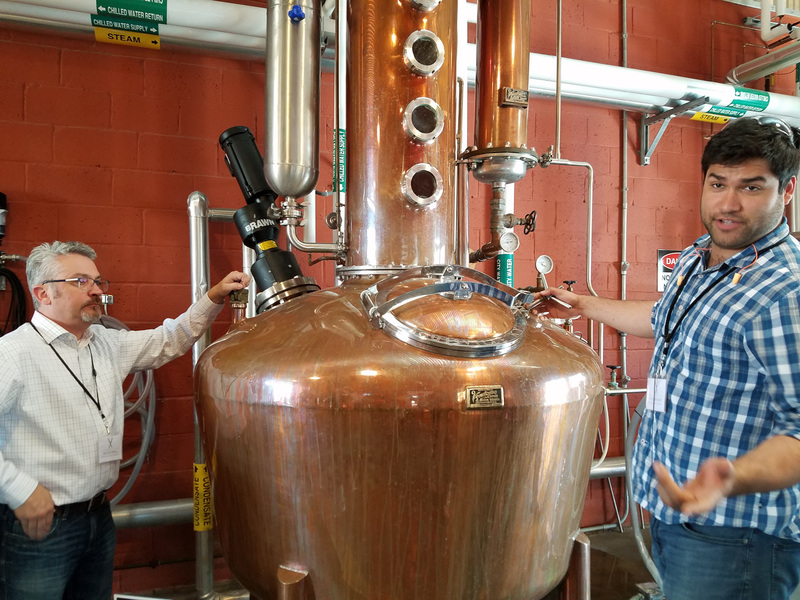 Moonshine University also offers a 5 day intensive distillation course and a 2 day sensory training program going in-depth on nosing and tasting spirits.